Daphne du Maurier was a British author of popular fiction who had the rare quality of being nearly as highly regarded by many critics as she was by her readers. As Margaret Forster wrote for London’s Sunday Times, ‘‘If all our popular bestsellers were of her excellence then there would be no need to deplore their existence, and the silly snobbery existing between ‘pulp’ fiction and literary fiction would vanish.’’ Though she wrote dozens of novels, short stories, plays, and nonfiction works, she is perhaps best remembered for the film adaptations of her work, including two films by Alfred Hitchcock: Rebecca and The Birds. Her Own Way. Daughter of renowned actor Gerald du Maurier and granddaughter of artist and author George du Maurier (Trilby), young Daphne first turned to writing as a means of escape. Despite a happy and financially secure childhood, she often felt ‘‘inadequate’’ and desperately in need of solitude. She delighted in the imaginary world of books and play-acting and stubbornly resisted ‘‘growing up’’ until her late teens. After shunning the debutante scene and a chance at an acting career, du Maurier was determined to succeed on her own terms— as a writer. During one ten-week stay at her parents’ country home on the Cornish coast, the twenty-four-year-old Englishwoman wrote her first novel, The Loving Spirit, a romantic family chronicle. A best seller that achieved a fair share of critical acclaim, The Loving Spirit so impressed a thirty-five-year-old major in the Grenadier Guards that he piloted his motor launch past the du Maurier home in the hope of meeting the author. Major Frederick ‘‘Boy’’ Browning and du Maurier married a few months later, setting off by boat on a honeymoon ‘‘just like the couple in The Loving Spirit,’’ according to Nicholas Wade in the Times Literary Supplement. Rebecca. Daphne du Maurier lived in Cornwall for forty years, twenty-five of them in Menabilly, a seventeenth- century house that she described as the most beautiful she had ever seen. Cornwall, a region of mystery and superstition and the home of legendary figures such as King Arthur and Tristan and Isolde, is a landscape easily made gothic; it is the home, as well, of pirates both fictional and historical, with a coastline that has been responsible for innumerable shipwrecks. While never a fully assimilated Cornishwoman, du Maurier was certainly inspired by her adopted home, the setting of some of her best and best-known novels: Jamaica Inn (1936), Frenchman’s Creek (1941), and The House on the Strand (1969). It is, therefore, not surprising that du Maurier took time out from her many successful novels to write a history of Cornwall (1967). It was in Alexandria, Egypt, where her husband was posted in 1936, that du Maurier began her fifth novel, Rebecca, published in 1938. Far from home, unhappy in the company of both the British military and the Egyptians, du Maurier often thought about Cornwall—fantasizing about, as much as recalling, its lush forests and pounding seas that stood in stark contrast to the stifling and arid desert. These fantasies and a sense of profound melancholy inform the mood of Rebecca, the story of a naive working-class woman whom the recently widowed Maxim de Winter marries and takes back to his palatial family mansion, Manderley, in the south of England. There the second Mrs. de Winter—her first name is never given—discovers that she must compete with the memory of the former mistress of the house, Rebecca, whose qualities, as the creepy housekeeper, Mrs. Danvers, constantly points out, were in dramatic contrast to those of the unsophisticated newcomer. But the bride comes to learn that she need not be jealous of her predecessor, for Max hated his first wife. Late in the novel, he is charged with her murder, but during the trial evidence is introduced at the last moment that exonerates him. Returning home, the de Winters discover that the distraught Mrs. Danvers has burned Manderley down; Max and his bride are free to start their lives over again. The response to Rebecca was overwhelmingly positive; critics pointed out that du Maurier could no longer be compared to the Brontes or to any other novelist, but had found her own voice. Du Maurier basked in the delight of her sudden fame for a time, and then went back to what she knew best—writing. Frenchman’s Creek was published in 1941, My Cousin Rachel in 1951, The Scapegoat in 1957, and Flight of the Falcon in 1965. According to Jane S. Bakerman, writing in And Then There Were Nine ... More Women of Mystery, these books are, in addition to Jamaica Inn and Rebecca, the six novels on which du Maurier’s ‘‘auctorial reputation rests most firmly.’’ There were certainly a bevy of others, including The King’s General, Hungry Hill, and The House on the Strand, but the core of her work can be seen in these six. Thomas Keneally (1935—): Australian novelist best known for his novel Schindler's Ark (1982), which was later adapted into the film Schindler's List. Gabriel Garcia Marquez (1928—): Colombian novelist and winner of the Nobel Prize in Literature. John Fitzgerald Kennedy (1917-1963): The thirty-fifth president of the United States of America, John F. Kennedy was assassinated on November 22, 1963. His term in office began in 1961. Lawrence Durrell (1912-1990): British novelist who was famous for his tetralogy The Alexandria Quartet. Northanger Abbey (1817), a novel by Jane Austen. Written early in her career but published after her death, this novel is a witty response to the popular gothic fiction of Austen's day. ''The Fall of the House of Usher'' (1839), a short story by Edgar Allan Poe. In this masterwork, the ''House of Usher'' reflects the decline of the family that inhabits it. As the last in the line of Usher becomes frail and his health fails, so, too, does the house of Usher crumble. House of Leaves (2000), a novel by Mark Z. Danielewski. As the marriage between the protagonists in this novel is challenged, the house in which they live expands— new rooms appear out of nowhere—and the characters feel compelled to explore the dark depths of these strange caverns that seem to stretch out for miles. An avid reader from early childhood, du Maurier was especially fond of the works of Walter Scott, W. M. Thackeray, the Bronte sisters, and Oscar Wilde. Other authors who strongly influenced her include R. L. Stevenson, Katherine Mansfield, Guy de Maupassant, and W. Somerset Maugham. From these writers, du Maurier grew to understand how to write a gothic masterpiece. The Gothic Thread. Gothic literature is marked by the fear of the supernatural’s intrusion into one’s life. Often, the setting for gothic literature is a large, dark, and foreboding castle or a weatherworn house on a wind-beaten plain, where characters find themselves isolated from the rest of society. The past—often represented by a ghost or the fear of a ghost—presents frightening challenges for the current inhabitants of these scary places. A further complication of traditional gothic literature is the inclusion of a love affair or marriage that is somehow challenged by the specter of the ghosts, both real and psychological, that haunt the settings. The Brontee sisters effectively utilized this formula in novels like Wuthering Heights and Jane Eyre, and it is in this tradition that one can best place du Maurier’s fiction. Legacy. Du Maurier was most proficient in creating psychological or gothic thrillers—usually with some connection to the past—that focus on the struggle of an individual against an oppressive environment. Her best novels—Rebecca, The Scapegoat, My Cousin Rachel, The House on the Strand, and The Flight of the Falcon—are strong in characterization, setting, and plot. Although she was able to live comfortably as a result of the commercial success of her works and was made a dame of the British Empire in 1969 for her literary contributions to the United Kingdom, du Maurier did not occupy a place in the literary canon during her lifetime—much to her disappointment. A reassessment of the canon has led in recent years to the “discovery’’ of several previously neglected figures in British literature, most of them women. This list includes Daphne du Maurier. While critics have praised a few of du Maurier’s novels— Rebecca and My Cousin Rachel—with unabashed joy, the novelist has not fared so well with her other work. Indeed, some critics find the plots of her other novels unlikely and the writing sloppy and unbelievable. Despite these problems, however, the overall assessment of du Maurier’s body of work has been largely positive—scholars finding the pleasure of du Maurier’s unlikely stories to outweigh the problems they find in the texts. Rebecca. ‘‘Last night I dreamt I went to Manderley again.’’ With these words, among the most recognizable in twentieth-century gothic fiction, Daphne du Maurier began her classic novel Rebecca. Described by the Spectator’s Kate O’Brien as ‘‘a Charlotte Bronte story minus Charlotte Bronte,’’ Rebecca takes a familiar situation (the arrival of a second wife in her new husband’s home) and turns it into an occasion for mystery, suspense, and violence. Its primary features—an enigmatic heroine in a cold and hostile environment, a brooding hero tormented by a guilty secret, and a rugged seacoast setting —are now virtual staples of modern romantic novels. Though reviewers have long pointed out (and du Maurier agreed) that she could not take credit for inventing this formula, many critics believe that du Maurier's personal gift for storytelling places her novels a cut above other gothic fiction. 1. Research the term melodrama. After having read Jamaica Inn, do you believe that du Maurier’s work can accurately be described as ‘‘melodramatic’’? Why or why not? Can you think of a film or novel that you have read that seems to be more melodramatic? In a short essay, explore these questions. 3. Du Maurier said that she was less interested in writing individual characters than she was in writing types of characters. What effect did this decision have on her novels? How does this focus affect your feelings about the characters that populate her novels? In order to answer these questions, consider the novels Rebecca and My Cousin Rachel. 4. People often say, ‘‘The book was better than the movie.’’ Considering how well du Maurier describes her settings, and considering how remarkably films can present these settings, which medium do you feel is more effective in capturing the essence of Rebecca? Why do you feel as you do? How important is the visual component in the appreciation of the novel? Auerbach, Nina. Daphne du Maurier: Haunted Heiress. Philadelphia: University of Pennsylvania Press, 2000. Cook, Judith. Daphne: A Portrait of Daphne du Maurier. London: Bantam, 1991. Forster, Margaret. Daphne du Maurier: The Secret Life of the Renowned Storyteller. New York: Doubleday, 1993. Horner, Avril, and Sue Zlosnik. Daphne du Maurier: Writing, Identity, and the Gothic Imagination. New York: St. Martin’s Press, 1998. Kelly, Richard. 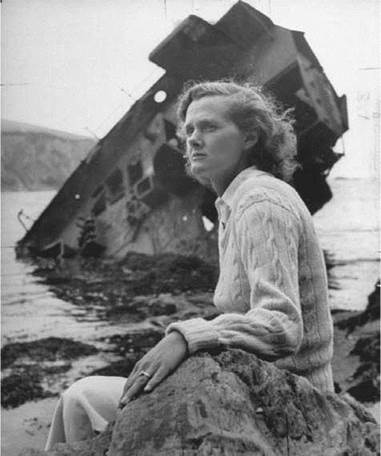 Daphne du Maurier. Boston, Mass. : Twayne, 1987. Shallcross, Martyn. The Private World ofDaphne Du Maurier. London: Robson, 1991.